The shoulder is the most movable and complex joint in the human body. And it’s ­basically unstable. Imagine a golf ball perched on a tee. That’s your shoulder. The humerus (upper arm bone) is the ball and the scapula (shoulder blade) is the tee. It doesn’t take much to knock them apart. Impingement: The rotator cuff, a collection of muscles and tendons surrounding the humerus, gets pinched between that bone and the scapula. 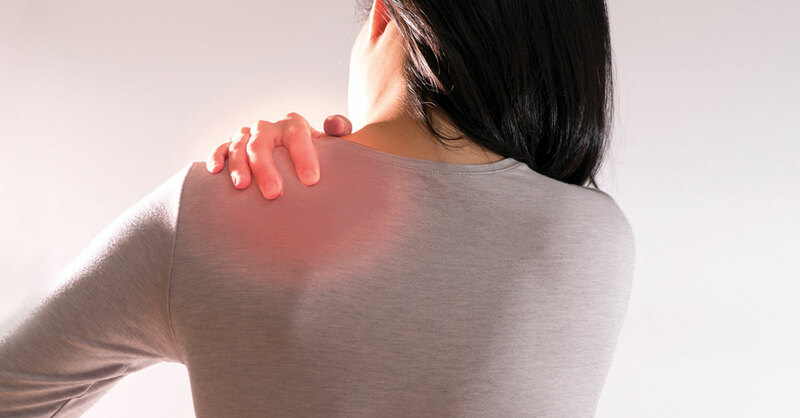 Frozen shoulder: Tissue around the shoulder joint gets inflamed and stiff. Tendinitis: Rotator cuff tendons become inflamed or irritated. Bursitis: Tiny fluid-filled sacs (called bursa) that act as a gliding surface to reduce friction between shoulder tissues become inflamed. Each condition is caused by inflammation, often as a response to tiny injuries that you didn’t notice when they happened. Each can get so painful that surgery seems like a good idea. But why go through that discomfort, recuperation and expense if you can avoid it? Surprising truth: With pain management and physical therapy, two-thirds of patients get better on their own. But if your shoulder is bothering you, that doesn’t mean you can just do nothing. Your pain will continue and even may intensify the next time you overstress the shoulder. Worse yet, you could get a rotator cuff tear, which definitely requires surgery and then four to six months of recovery. If you feel pain in a shoulder and your movement is restricted, see an orthopedist right away to rule out a rotator cuff tear. As long as your rotator cuff is intact, you have a very good chance of making your shoulder feel better and avoiding surgery if you, in consultation with your doctor, follow these steps. The first step is to manage your pain so that you can start physical therapy. Ice your shoulder for 20 minutes at a time, two or three times a day. Also, take a nonsteroidal anti-inflammatory drug (NSAID), either over-the-counter or prescription, to reduce inflammation and pain (don’t exceed the recommended dosage). If that’s not enough to ease pain and allow exercise, your doctor can give you a cortisone shot. It’s a potent anti-inflammatory, but repeated shots can limit a tendon’s healing ability. My protocol: If a first cortisone shot works for two months or more and you can exercise, I typically recommend a second shot and continuing physical therapy. But if the first cortisone shot doesn’t ease pain and allow exercise, I offer patients platelet-rich plasma (PRP) injections ($1,000 to $2,500). It’s experimental and generally not covered by insurance. If PRP doesn’t work, another option is to use donor stem cells from amniotic membranes to help regenerate tendon tissues. This can be about twice as expensive as PRP, and insurance most likely won’t cover it either. These treatments don’t work for everyone, but if they do, shoulder discomfort should subside within three days to a week. Tip: You also may want to consider acupuncture as a complement to any of the above approaches. Once pain isn’t holding you back, it’s time to get your shoulder moving. You can complete this stretching/strengthening program in 15 minutes. Do it twice a week. It’s also great for anyone who wants to avoid shoulder problems. Important: You should never feel pain when doing either stretching or strengthening exercises. These exercises might sound like a lot of work, especially if you’ve become accustomed to avoiding using your shoulder because of pain. But take it from someone who both performs necessary shoulder surgery and does my best to help patients avoid it—it’s well worth the effort to avoid the knife. I do these exercises myself two or three times a week—I’ve had shoulder pain in the past, but these exercises let me stay strong and pain-free. Wall crawl. 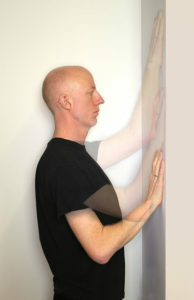 Stand facing a wall. Place the palm of one hand in front of your chest and “walk” it upward along the wall. Go as high as you can without feeling pain, hold for three to five ­seconds, and walk your hand back down. Do five to 10 repetitions. Switch hands and repeat. Doorway stretch. 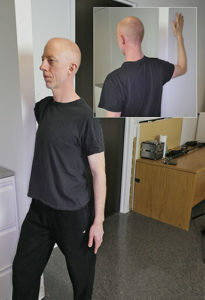 Stand in an open doorway, and place your right hand flat against the wall next to the right side of the doorway frame at shoulder height, with your elbow bent. Keeping your right hand in place, step forward with your right foot, bending your right knee (as in a lunge), with your left leg stretched behind you. You should feel a stretch in your shoulder but not any pain. Hold for three to five seconds, and do five to 10 repetitions. Repeat with the left arm on the left side of the doorway and left foot stepping forward. Side stretch. Lie on your side on the floor (on an exercise mat or rug), your painful shoulder on the floor and your head supported on a pillow or bolster so that your spine is in a straight line. Bend the arm that’s on the floor at the elbow, with the forearm and hand raised and palm facing your feet. 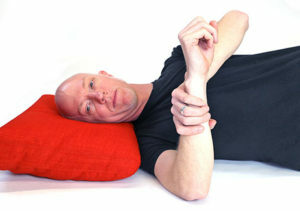 Now use your other hand to gently push the wrist of the bent arm toward the floor. Hold for three seconds and release. Do a total of 10 reps. Repeat with your other arm. While impingement, frozen shoulder, tendinitis, and bursitis often are referred to as overuse issues, I prefer to call them “understrength” issues. The problem isn’t the 100 times you serve during a typical tennis match—it’s that your muscles aren’t strong enough to handle the stress you’re placing on them. Even people who lift weights often focus on the biceps and triceps and ignore the rotator cuff. Caution: Stay away from military presses and other exercises that require you to lift weights overhead—that can injure your shoulder. Skip kettle bells, too—they require swinging that can inflame your shoulder. External rotation. Loop a resistance band at waist height around a secure anchor such as the base of equipment at a gym or a strong door handle of a locked door at home. 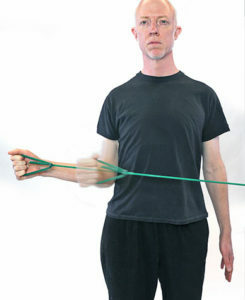 Standing sideways to the anchor, grab both ends of the band with one hand so it’s taut. Keep your elbow bent and against your side and your hand near your stomach. Now pull the band away from your stomach, keeping your elbow against your side, until you feel light tension on the outside of the shoulder. Hint: Your shoulder blade should move toward your spine. Hold for one second. Do a total of 10 reps. Repeat with your other arm. Internal rotation. This is the reverse of the external rotation. 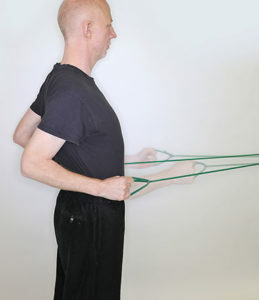 Keep the resistance band looped around a secure anchor, and stand in the same position as above. But this time, grab the band with the hand that is closest to where it’s anchored. Keeping your ­elbow bent and at or near your side, pull the band across your torso toward your belly button. Hold for one second. Do a total of 10 reps. Repeat with your other arm. Rowing. With the elastic band securely anchored as above, grab one end of the band in each hand so it’s taut. Pull both arms back, bending your elbows and keeping them close to your sides. Hold for one second. Do a total of 10 reps. Repeat with your other arm.